Haus The Bott is a tool that allows couples, roommates, and anyone with shared shopping lists to have access to real time information about what items are in your house and what items still need to be bought. 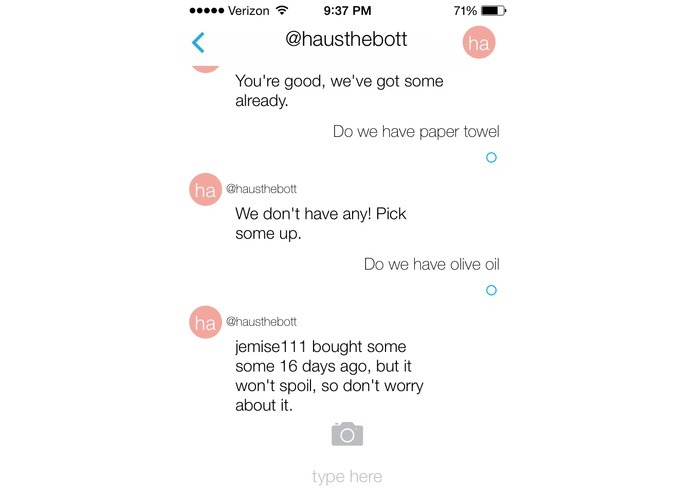 Using Inbox The App's new api for developers, we designed a chat bot to interpret certain commands that allow users to interact with their house's shopping list. Users can add and retrieve items anywhere, anytime. Just picture yourself in the grocery store while your two roommates are at work and you have no idea if either of them bought toilet paper or replenished the milk. Just send Haus The Bott (@hausthebott on InboxTheApp) a message asking "Milk?" and you'll find out the last time someone bought milk, if ever. In the car and just remembered you need to grab that birthday cake tomorrow morning? Tell @hausthebott to "add birthday cake" and it'll take care of the rest for you. Then in the morning ask for your "list" and you're all set.